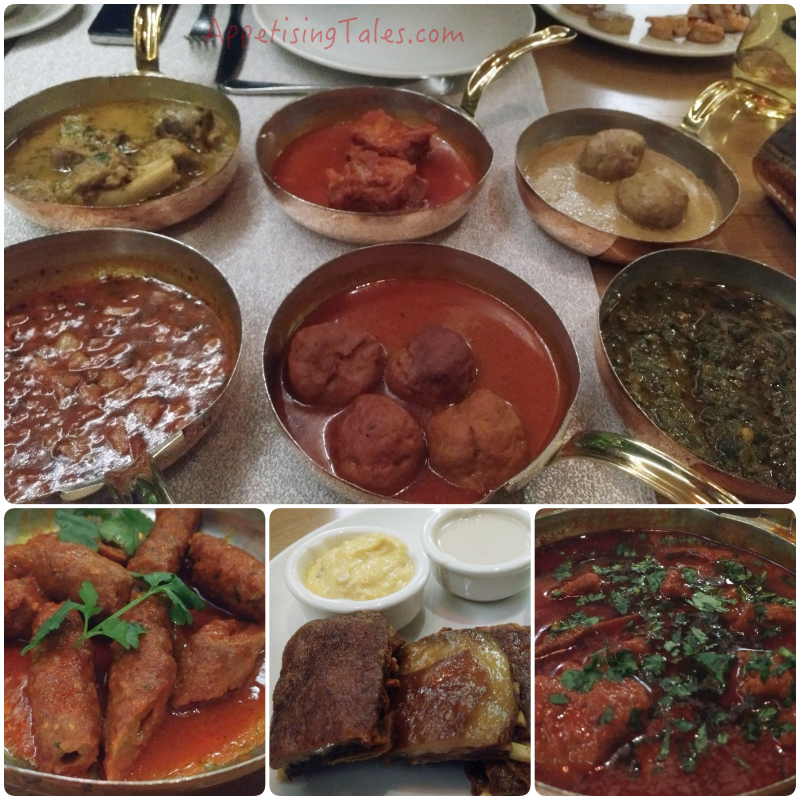 Kashmiri cuisine is clearly the flavour of the season. Such is the popularity of this fare that an average Delhiite now even knows the nuances of this regional cuisine. Most people know, for instance, that there is a distinct difference between a Wazwan and Kashmiri Pandit cuisine. While the latter is cooked without onion and garlic even in meat curries, the former uses an abundance of both. There is thus an increasing demand for the variety of dishes from the Valley. Deepak Negi serving the kahwa with aplomb. Kashmiri handicrafts for sale at Tamra. With practically every five star hotel in the city curating a pop up, Kashmiri food festivals are a dime a dozen. What sets one festival apart from the other is obviously the quality of the food. 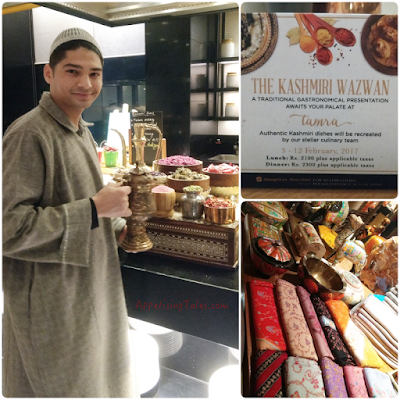 The all-day dining at Shangri-La’s - Eros Hotel, New Delhi, Tamra, has a Kashmiri Wazwan on offer currently as part of their regular lunch dinner buffet. Special Wazas have been flown in from the Valley. 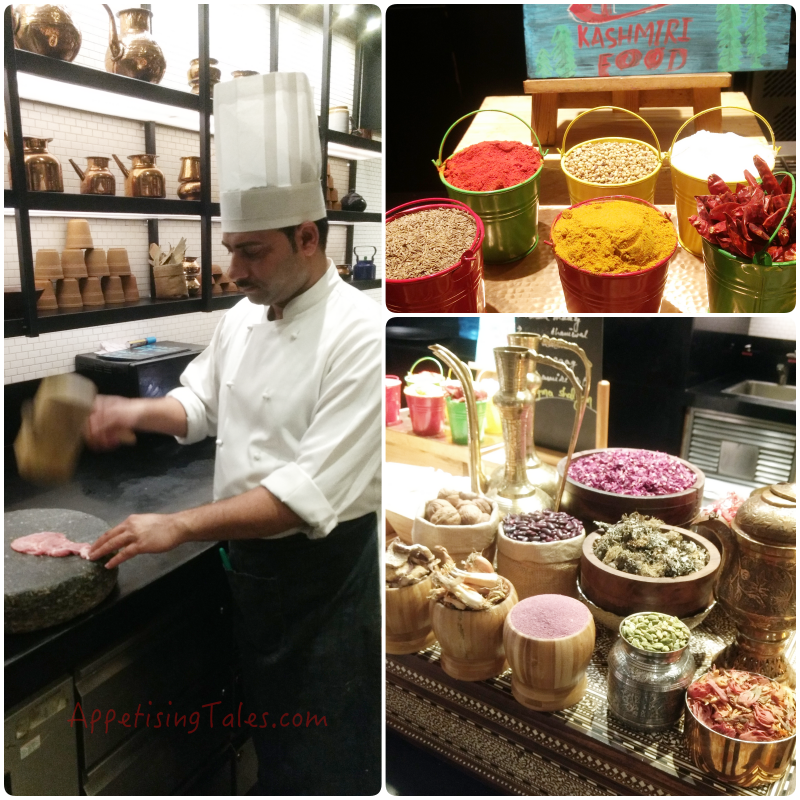 They have brought with them spices, ingredients and even traditional equipment - the 'takhat' on which the meats are pounded have been brought in from Kashmir. Executive Chef Neeraj Tyagi along with his very capable team has of course provided complete support to the Wazas for creating an authentic experience for guests. I am told by Chef Gagandeep Singh Sawhney that everyday four full goats are brought for the festival and the Wazas cut the meat according to their requirements since each dish requires a specific cut. Since frozen meat lacks the appropriate texture and eventually the flavour, fresh meat is procured at temperature, especially to enable the pounding as required for rista and goshtaba. A Waza chef showcasing the pounding of meat on a traditional takhat. Many spices and dry ingredients have been brought in from the Valley. Waza Mushtaq Sofi, who lives close to Laal Chowk in Srinagar, explains to me that the shallots used in Kashmiri curries are known as ‘pran’ impart a unique flavour. While showing me the thin, elongated bulbs he says that these are finely chopped and sauteed in desi ghee till they soften and then ground into a paste. This paste is then used to make different curries. While I have to confess that I the tabak maaz is a tad chewy, the goshtaba is one of the best that I have ever had. The curry is not as watery as is normally served, and the tang from the yoghurt is enhanced with saunf powder, ginger powder, green cardamom and the pran paste. Dhaniwal korma is a lighter curry but it too is very aromatic and flavourful. The roghan josh is rich with saffron while the mirchi korma has the distinct flavour of Kashmiri chillies that are ground and missed with water to make a paste and then strained and used in the curry. methi maas, rista, haaq saag. Bottom: Seekh kebab, tabak maaz, mirchi korma. 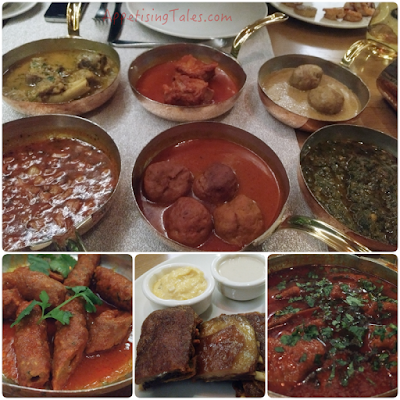 While the Kashmiri food is of course the highlight, it is good to know that it is part of Tamra’s popular multi-cuisine buffet. So you can venture to the Japanese or Italian counters if you so wish. But do round off your meal with a refreshing bowl of phirni and a cup of kahwa. The Kashmiri Wazwan till 12 February 2017. Tamra, Shangri - La’s - Eros Hotel, New Delhi, 19 Ashoka Road, Connaught Place, New Delhi 110001. Timings Lunch 12.30pm - 3.30pm; Dinner 7.30pm – 11.30pm. Prices: Lunch Buffet Rs 2100 plus applicable taxes; Dinner Buffet Rs 2300 plus applicable taxes.